This week, we focus on the Advent of Hope. I keep sitting down with an idea and as I begin to type the words, I can think of situations happening in the lives of those I know and love or just in our world where I ask the question: Does this really apply there? 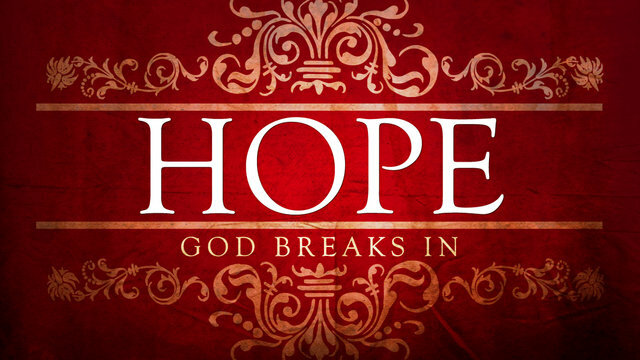 How do we learn to hope or persevere in hope in the midst of hopelessness? So I offer these word tentatively and knowing they may not apply to all situations. I am insulated from a great deal of the hopelessness I see in the world. But the more I engage with people who experience hopelessness and despair and suffering, the more I see Jesus as the ultimate solution and answer. So I pray these words point us to Jesus. Our Advent texts this week point us to hope in the midst of despair. We hear the cry: How long? as the people of God actively wait for God to intervene. Their cry is not simply one of hoping circumstances might “pick up” but that circumstances would be radically altered. It is the sense that what is going on right now is unjust and oppressive and should not be the way it is. And slight modifications of the current way of viewing and doing things is not enough to bring relief. Underneath this there is a story being told. If things are unjust, oppressive, or in need of transformation, then there is a sense of a better way being possible. Perhaps it will require God to rip open the heavens, but possibility is there. If things are not how they are supposed to be, then there is an “ought” to the universe. There is another story possible. We may not even know what it looks like for things to be righted and changed, but we hang on to the hope that transformation is indeed possible. To hope. And to stay awake. Christian hope is actually very different from how it often gets presented. To many people, Christian hope is about saying or doing the right things so you can escape hell when you die. This kind of hope does not often deal with the grizzly realities of life. This kind of hope deal with ideas, guesses, and arbitrary rules. Christian hope deals with reality. Christian hope exists not only because it recognizes things are not the way they are supposed to be, but as a promise that these things will indeed be righted. God has plans and intentions for the world. And Advent is a time to remind us that God does not give up. God should give up. Human beings trash the plans made for the world and each other. It would be easier to just quit. But God keeps working. Then God sends a child. A child who will eventually conquer death. But comes to us first in the form of a helpless child. If you aren’t paying attention, this child is easy to miss. The sky is not ripped open (yet). But an infant is born to a poor, unnoticed family. As the people long for liberation and justice and for things to be different, a child is born completely under the radar. This is the call of Advent. We stay awake, because of hope. Staying awake is about paying attention to both the grizzly realities of our frail existence, and the miraculous ways God’s kingdom breaks into our world. It laments that which is not as it should be. And it gives thanks for the moments when hope becomes concrete. Staying awake is being honest and present right here, and right now. In Advent, we ask the question: Where is God working now? What can I be grateful for? What should be lamented and who can I join in this lament? What is this lamenting calling me to do? What has God been doing in the forgotten and unnoticed places? How do I join God in that work? These are tough questions which require us to be awake to the realities of the world around us, and be confident in the hope of God putting the world back together. When we stay awake we see the world as it is, but we look even harder for where God is working and moving in the world. And we look because we hope. We know God has not given up. We know God does not stop working or take a break because God’s desire for the world is all things to be reconciled. So in Advent, we wait. We look. We acknowledge. We lament. We mourn. We celebrate. We give thanks. We stay awake. And are confident in hope. This entry was posted in Advent and tagged Awareness, Hope. Bookmark the permalink.